Going Vegan Day 4: Why Have I Never had a Soy Chai Latte Before? Oatmeal with cinnamon, raw sugar, and grated apple. In the morning, I decided to give this oatmeal thing another shot. But no more muesli–I cooked rolled oats in Apple Broth, with a little brown sugar and cinnamon. 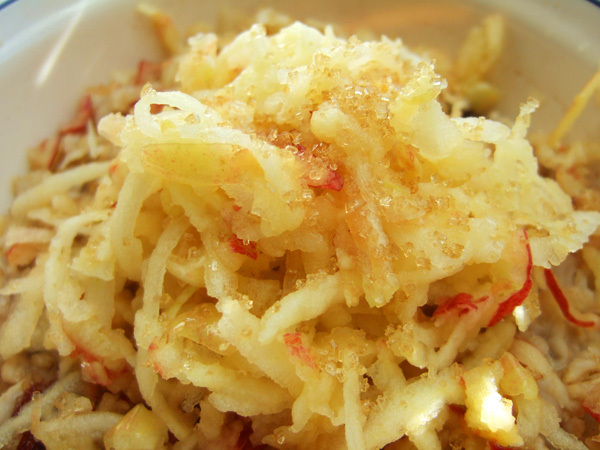 Then, when it was all hot and steamy, I topped it off with a grated apple. This. Was awesome. The softness of the oatmeal with the textural crunch of the apple was perfect; I would definitely make it a part of my normal breakfast routine. I had another day of running around in Manhattan ahead of me, and after a morning meeting, I felt my blood sugar crashing. I decided I needed a Starbucks, not just for the chai, but for the bathroom. I know I talk about my bowels a lot on this blog. But what goes in is linked to what comes out. During this week, my boyfriend and I have both experienced a demanding and urgent regularity in the movement of our bowels. Now you know. After taking care of business, I ordered up a chai with soy milk, which I would have never had gotten if not for this experiment. And it was utterly delicious. 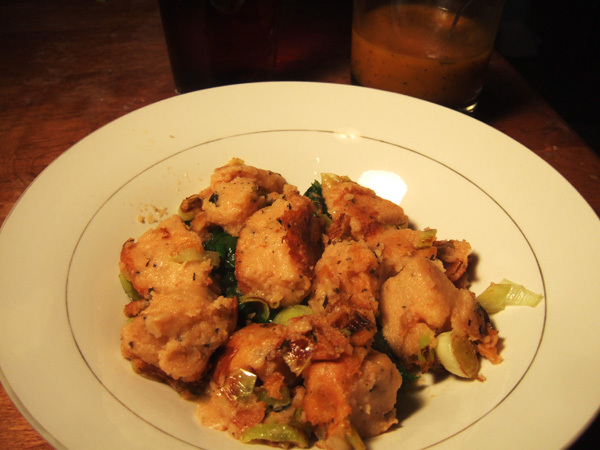 The soy milk added a nuttiness that married well with the chai spices. I remember ages ago someone told me to try a chai with soy milk, and I poo-pooed them. “Soy! ?” I thought, “Blech! I only drink cows.” But I was wrong: my soy chai may have been the best chai I’ve ever had. When I returned home in the late afternoon, I mixed myself up a gorgeous, late summer salad. Henderson gives charming advice on salad building, offering suggestions for Foundation (lettuces and other greens), Interest (tomatoes, carrots, edible flowers, fruits), and Piquancy (horseradish, fresh mustard, and garlic “if appreciated.”). 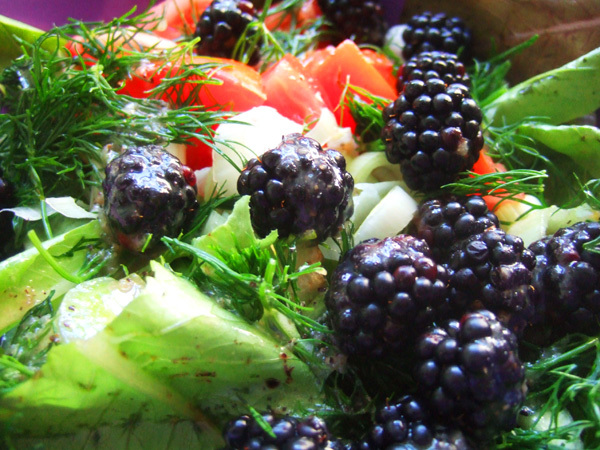 I did a variation on her “Summer Salad,” with blackberries and dill. By the way, most of my veggies for this week came direct from a farmer upstate, via the Long Island City CSA. Summer salad, with mixed greens, tomato, leek, blackberries, dill and olive oil vinaigrette. I loaded them up with dried herbs from my mother’s garden and served them fried with sauteed spinach and onions. I made a quick soup with a small squash and carrot, and my boyfriend picked up some pumpkin ale on his way home with work. So Fall! Dinner was good, but at the same time, I began to grow tired of all of my meals centering around one or another type of moosh. “Gnocchi,” with squash soup and a pumpkin ale. My boyfriend and I spent some time reflecting on the past few days; the next day would be our last as vegans. Agreed. One more day left, and I’m throwing a special dinner party for some Real Vegans. The issue with the cake is possibly related to the amount of sugar you regularly eat. 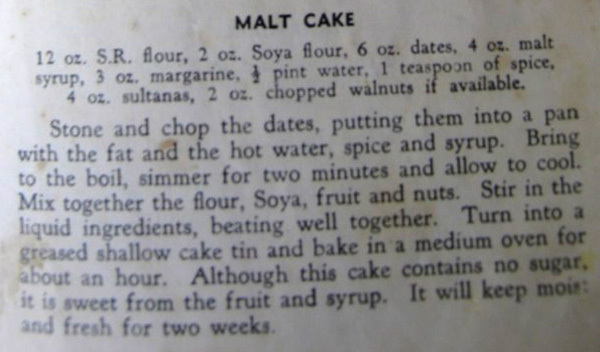 For someone who doesn’t eat a lot of sweetened things, that cake is likely just right. A basic yellow cake recipe usually has about a cup of sugar. A lot. A basic cookie recipe might have a cup and a half of brown and refined sugars combined. Yummy, but when you are used to that, anything less tastes like crap.